Storemasta’s new range of larger safety cabinets are both user friendly and space efficient. The safety cabinets are available to suit every storage situation safely. All safety cabinets have individually self closing and latching doors and independently adjustable shelving for convenience and maximum utilisation of space. Roller bases are an optional extra to make light work of those heavy drums. All safety cabinets also have built in vents and flash arrestors. Advanced manufacturing processes with strict quality controls ensure that every product is of high standard. These innovative designs are available to suit every situation where higher quantities of dangerous goods need to be stored safely and efficiently to Australian Standards. 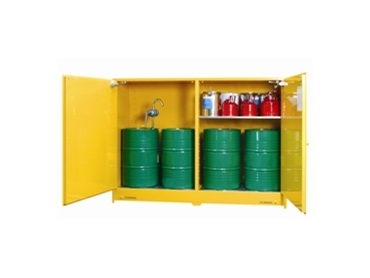 These heavy duty safety cabinets are manufactured to suit storage of liquids from 250 litres to 850 litres. As an optional extra the safety cabinets may be finished in a two pack paint finish to enable external use.